Last Thursday I went back to Exeter for 'Light Up your Style' which was Princesshay's late night Christmas shopping launch event. Princesshay is a gorgeous shopping area so the event worked really well there and it was nice to come back my home city briefly! I planned to meet up with Milly from A Sensible Heart and also got to meet Albertine from Dippy Writes and Jodie from A la Jode for the first time. We started the evening at Wagamama where we were treated to a meal (more about that soon!!) and also a little goody bag. We then proceeded to go and indulge ourselves in hot winter pimms and churros as well as exploring the evening events, which included competitions to win outfits and roaming models in outfits from some of the stores. Hannah in Primark coat and scarf and her own customised DMs. Jessica in Jones boots, Wallace coat and her mum's scarf. Katie with a New Look back and River Island shoes. Russel with trousers from the Officer's Club and River Island shoes. 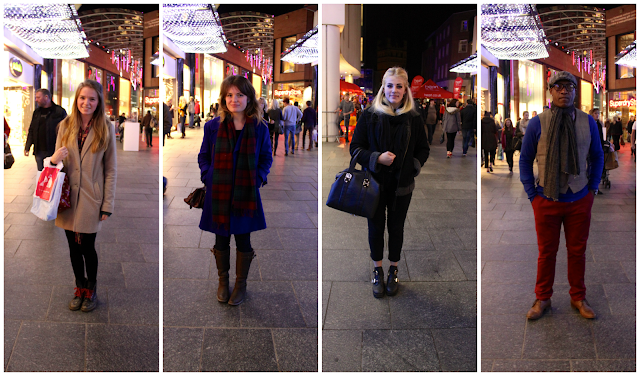 We were also official 'style spotters' for the evening and took a few snaps of people wandering about and looking stylish which was fun :) Princesshay will be open until 9 pm every Thursday until the 19th of December for all of your Christmas shopping needs and there will even be carol singers on the 12th!! update: One of my photographs was featured on the Express and Echo site!